Probably among the top-ten best days of my life was that Eagle Scout Court of Honor and LDS Ward Scout Dinner. That picture is full of joy and pride untainted in myself of the pains of adulthood. Oh, I'd been through some teenage angst, but my family and security were solid. And I was blissfully unprepared for the clouds of Wyoming coal-dust snow and mud-rain summer that were to descend upon us. Note the Council patch on my dad's shoulder below. He had already been to Rock Springs, Wyoming, as the new Council Executive of the Jim Bridger Council, BSA. It was a great honor to get your own council even if such a small one in membership if not in size stretching for a hundred miles in any direction with few roads and fewer people in between. The Scout dinner also turned into a farewell for the Vaughns from the Redmond Ward. Family friends, many from the old Young-Marrieds group of the mid-sixties chipped in to buy my parents a silver plated punch bowl for continued entertaining. My dad held it aloft like he had just won the Gran Prix. There in that cultural hall sit friends and relatives. My maternal Grandpa sitting back a row between Mom and Dad has almost as big a smile on his face. There are an aunt and uncle to the right of my Grandma. on the other side of my dad is an older couple who were sort-of adopted grandparents which was nice as they had a house with boat and beach on Lake Washington. on the right is my Mom's second-cousin and her husband who bought our house as a rental property. I see my home teacher in the crowd, the bishop, and childhood friends mainly because our moms were friends. That's how it worked in those days. The Redmond Ward was formed out of the Bothell and Kirkland Wards in 1969. 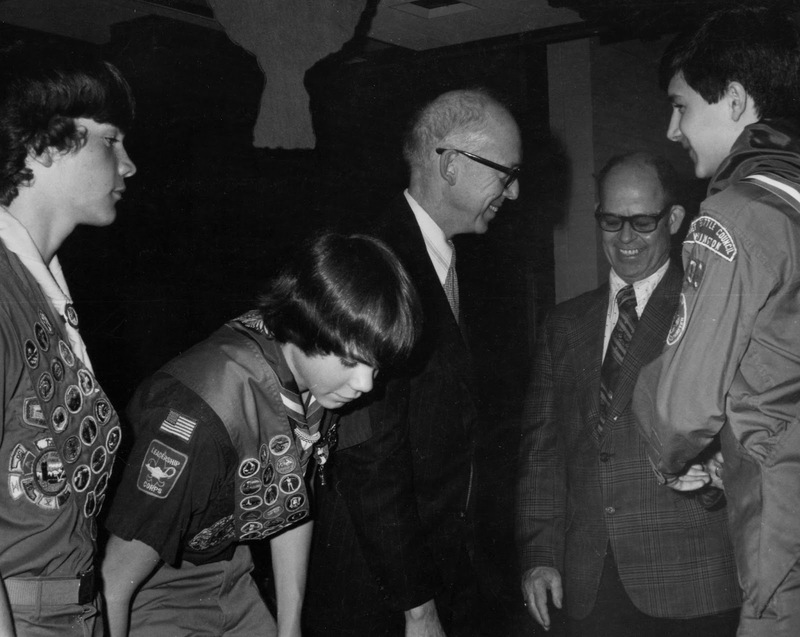 My Dad was instrumental in making sure our Scouting Program was good. 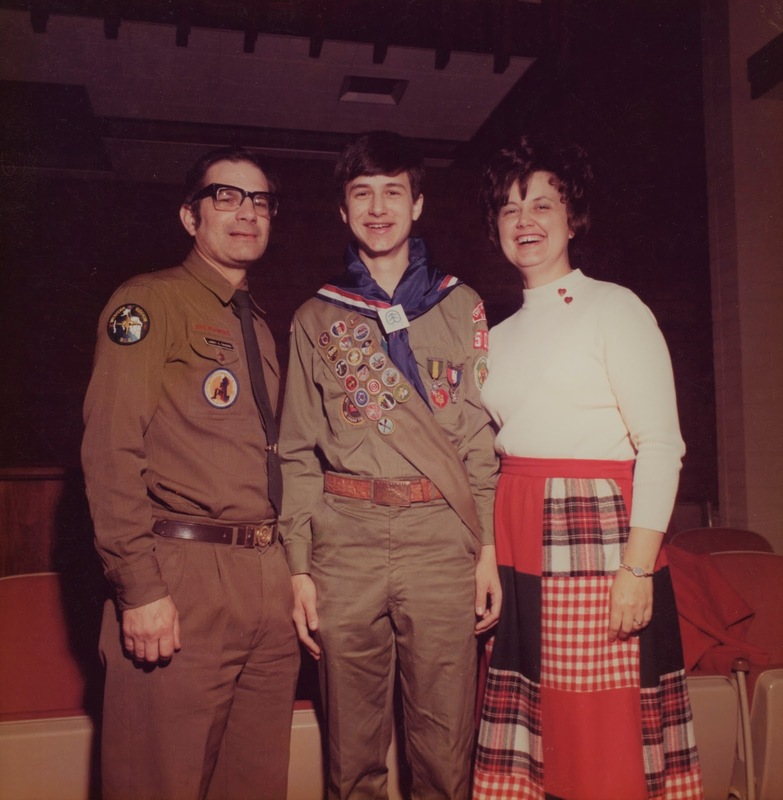 I was not the first Eagle Scout in that Ward as at least one friend younger than I already had his in the pictures. (Now all three wards are their own LDS Stake. The current Kirkland Stake Center is a couple of blocks from our old house next to my Jr. High!) There were several more Eagles who followed in quick succession. The guys older than me had never caught on to the basics. 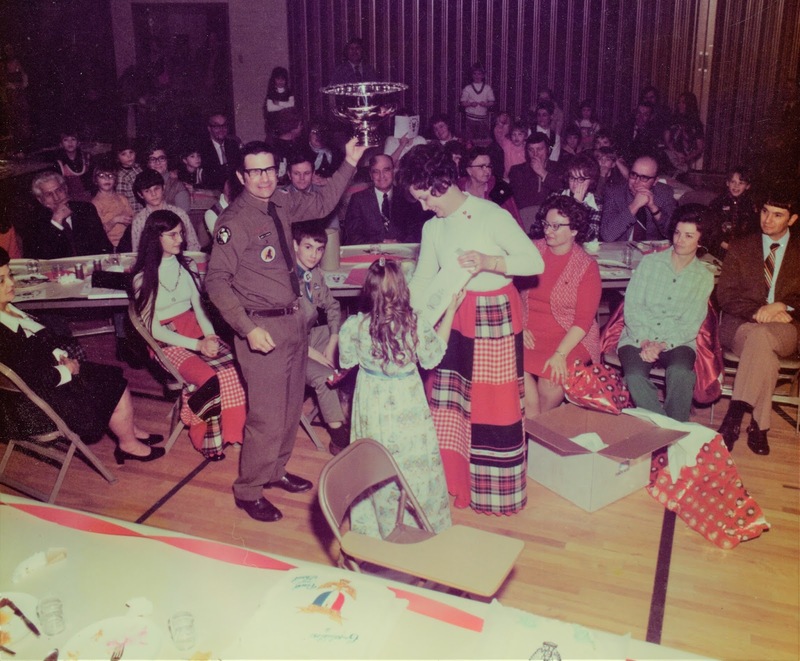 Those younger excelled in advancement serving on camp staffs and attending Jamborees. I'm talking to my childhood doctor and another Scouter friend of Dad's (neither LDS) who also served as a foster Grandpa. I can't remember the name of the kid on the left, but the one bending over was a good friend and already an Eagle. Sixteen-years-old seems like the start of adulthood when you're in it. I had my drivers license. In fact as my dad flew back to Wyoming, I drove my Mom, little brother and sister, all the way as my Mom pretty much cried for 1500 miles. This was to be a big adventure for the family. I had been making adjustments in my growing-up and was idealistic enough to think it would be great like some Western adventure. My Dad had already given subtle warnings that it was cold and miserable and dirty. I thought I would get on the student council and clean up the litter in the town! Oh, the smashed idealism of youth! We stayed in Rock Springs for a few weeks with my Grandpa's cousin while our pre-fab house was put together. We were surprised on arrival late that first Saturday night by the Cowboy/coal-miner traffic of wild men and not much milder women. Later, we got used to cruising K Street ourselves yelling at the street-walking ladies. None of us indulged, but there wasn't much else to do beyond tawdry entertainment. Early that first Sunday morning, my brother and I got up and I drove him around the quiet town for our first daylight view. We ended up on a dead-end, dirt road to a cliff overlooking a small-town industrial wasteland without even a green tree to crack a smile out of our shock. Wyoming wasn't all bad, just most of it. I'm still not sure if we ever fully recovered. For my part, I was lucky enough to escape to college before all my idealism was completely ground into the sterile, caliche soil. Back to that sixteen-year-old Eagle. 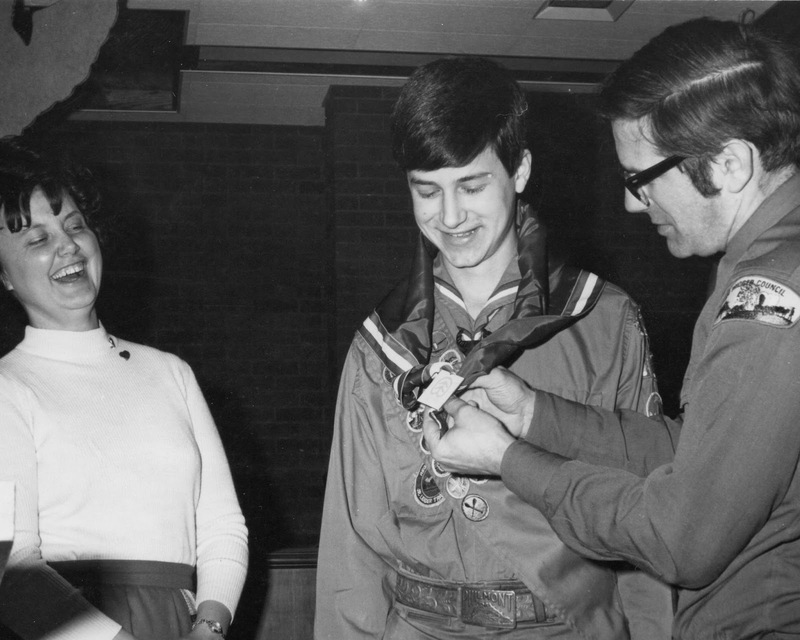 Scouting was my Dad's life. He went to college and developed talent in art but felt the need to find a profession to raise a family. Youth Leadership was brand new at BYU and remembering an admired Scoutmaster and a fantastic trip to the 1950 National Jamboree at Valley Forge, Pennsylvania, my Dad took Scouting on as a career. He wanted to make a difference in the lives of young men. It was a lifestyle profession for all of us. I would not have become an Eagle but for the support, encouragement, and some nagging of my parents. I had been in modest, teenage rebellion, but I came out of it mature enough to accept the importance of the Eagle not only for my Dad and Mom but for myself. I enjoyed many parts of it. Of particular effect were the Citizenship Merit Badges, Community, Nation, and World, drudgery for many, and sending me on a path for college studies and an ultimate profession in civil service and the Law. There are many things in life for which we are responsible and many that are given us for good or ill for which we bear no responsibility. Eagle Scout was part my responsibility and in great part given to me. And that was for the good. Rock Springs was not my responsibility and it was not good. So my duty is to forgive even if forgetting is impossible. It was a big burden for that sixteen-year-old. It's no less for an older man 43 years later. It helps to let it out. A created scene at one of the good parts of Wyoming. Lake New Fork, Wind River Mountains, near Pinedale. My Dad did this acrylic just after I left for Brazil. I sit alone on the far right. The dark clouds are significant. Great post Grant. I love these pictures! I confess I've gone to read this a couple of times, and not been able to get through for fear of tearing up on the bus. I confess to being a bit of a "Stand By Me/The Wonder Years" tragic, and found myself reading in my head with the voice of Richard Dreyfuss. Perhaps I envy - even covet - the "coming of age" experiences of other guys (real or imagined) compared to my own. Being the eternal pessimist, I was dreading where this post was heading though; very much a Tale of Two Cities. I'm glad there were "best of times", as your face exudes what certainly seems real unabashed happiness! But I still got the feels about how the Rock Springs experience has impacted your life; wow. And yet I'm so glad you shared it, because I truely felt the catharsis of the sharing. Thank you my friend. And sorry for this convoluted stream of consciousness! Thanks, Colin. You're a good friend who "gets it."